One of the ways the United States Tennis Association Incorporated ("USTA") continues to succeed is through awarding grants to organizations that promote and develop the growth of wheelchair tennis and use the sport of tennis to build stronger, healthier communities. 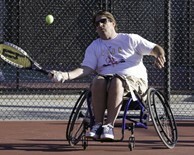 This grant is designed to target wheelchair programs that are growing wheelchair tennis in their local areas. programmatic needs of the organization. Please email wheelchairinfo@usta.com with any questions.